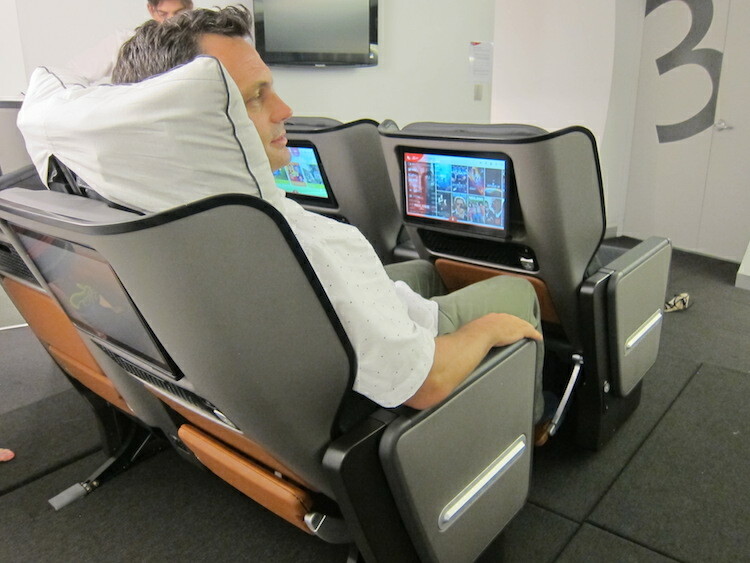 A mockup of Qantas’s new 787-9 premium economy seat. 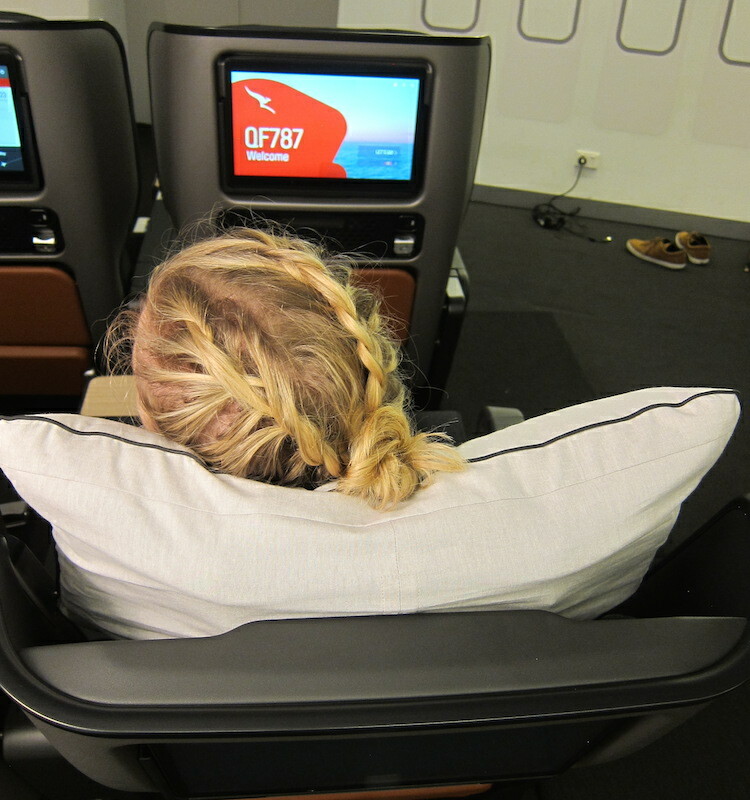 Qantas has placed the focus on sleep in the design of its new premium economy seat on the airline’s Boeing 787-9 Dreamliners scheduled to operate the 17-hour journey from Perth to London. The new seats were unveiled at Qantas’s first half results presentation on Thursday and feature a distinctive adjustable footrest and footnet, an ergonomic pillow designed to fit onto the headrest and a cradle-style recline designed to give the passenger maximum support while minimising the intrusion to those sitting behind. Premium economy on Qantas’s 787-9s will comprise 28 seats spread across four rows in a typical 2-3-2 configuration in its own mini-cabin. Qantas said in a factsheet accompanying the premium economy launch the seats have been pitched at 38in and were up to 22.8in wide thanks to some sculpting around the armrests. The seat back inflight entertainment screens feature Qantas’s Panasonic product also seen on the airline’s Airbus A330 fleet. There was a USB charger in the armrest, as well as in the back of the seat. “This new premium economy seat had serious wow factor,” Qantas chief executive Alan Joyce said in a statement. The seat itself was a based on one from Thompson Aero Seating, which also designed Qantas’s new business class seats on board its Airbus A330 fleet. From there that basic structure, it was customised by Australian industrial designer David Caon working in collaboration with Qantas. 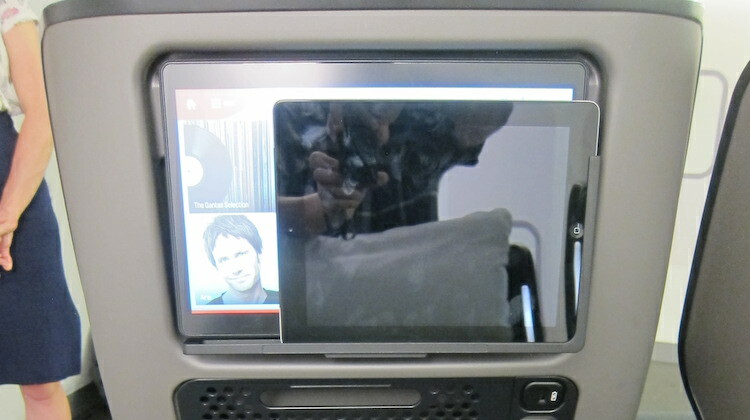 That process resulted in a number of “bespoke elements” such as the pillow being attached to headrest, a night light that was built into the seat shell, and an L-shaped bracket that allows the passenger to place their tablet or smartphone in front of the IFE screen. Caon said the distinctive feature of the Thompson Aero Seat was its recline. “Passenger comfort is really important,” Caon told reporters during a media briefing on Wednesday, prior to the official launch. “That combined with the footrest allows you to really extend out and get really really comfortable without your body sliding down. Moreover, the way the seat reclined minimised the intrusion into the personal space of those sitting behind. “The effective recline is nine inches, I think the intrusion into your space is only about four or four and a half,” Caon said. 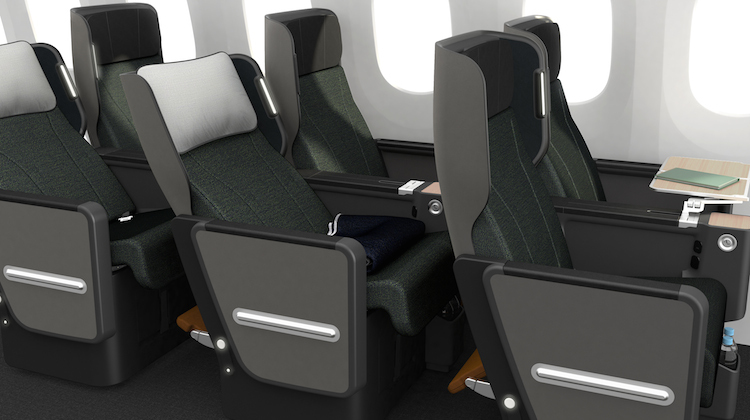 And in a feature more reminiscent of business class seats, the armrests on the aisles are able to be dropped down, allowing passengers to get out of the seat without moving the seat back to the upright position. Qantas’s 787-9s are configured to carry 236 people, with 42 seats in business class in a 1-2-1 configuration offering direct aisle access for every passenger, 28 in premium economy laid out 2-3-2 across and 166 in economy in a 3-3-3 layout with 32in seat pitch and 17.2in seat width. 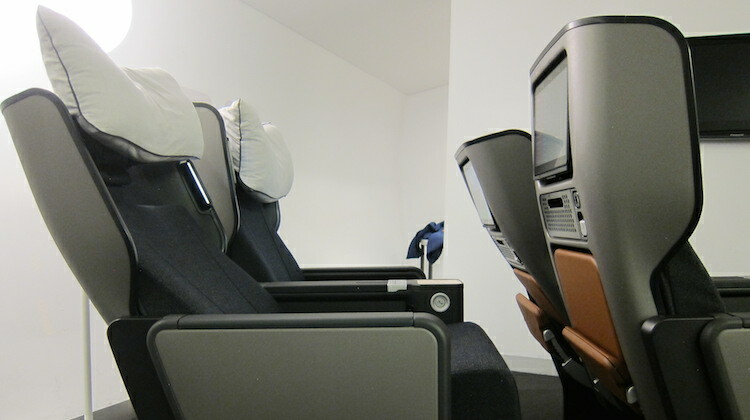 Currently, Qantas offers a premium economy on its Boeing 747-400/400ERs and Airbus A380s. The airline said in a statement it would “assess updating existing premium economy cabins in line with its fleet planning and product cycles”. Qantas was expected to take delivery of its first 787-9 in October. The oneworld alliance member has eight of the type on firm order, while it also holds a host of options and purchase rights for the 787 family of aircraft that have to be exercised between now and the end of the decade. The first Qantas 787-9 long-haul route is Melbourne-Los Angeles, which was due to begin in December. Perth-London flights were slated to take off from March 2018. 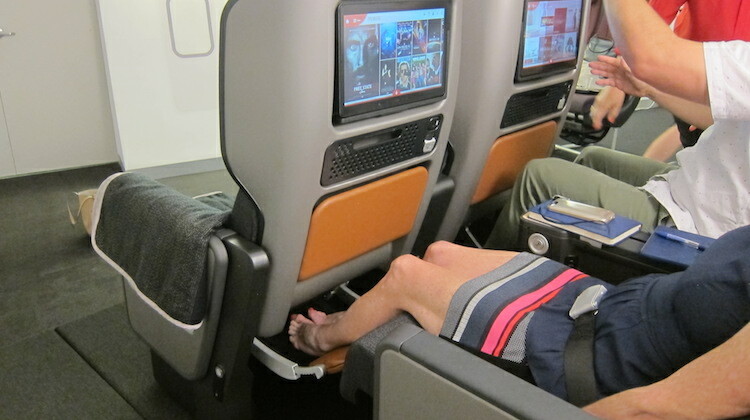 Great seats Qantas will ability to get legs lifted;. may be 35 or 42 seat premium economy section will meet demand rather than 28. Hopefully A380 fleet and 747’s will be retrofitted. Will the 787 come with wifi, anyone know? All very good for the Premium Economy passengers, but the hundreds of cattle in 3-4-3 seats are going to be pretty squeezy! From my home city Canberra, routing Canberra-Perth-London sounds attractive in place of Canberra-Syd/Mel-Dubai-London but the attraction of a 1″ wider seat on A380 probably still wins. How about an article showing what the Dreamliner will look like for the 80% or so NOT flying in pricier seats? Looks to me like Alan Joyce personally chose theese seats. Only a short person could fit in them! Leg room looks ridiculous and this is supposed to be Premium Economy! Sorry Qantas but why would I pay you more than other airlines charge just to be stuck in your cramped seats. What are the economy passengers going to get!! Retrograde product, that seat pitch looks terrible! Plus 10 abreast in Economy??? Seatbacks appear to be short on height. Or are the models very tall? When reclined it appears that headrest will protrude into rear passenger space who will also be able to see forward into the front passenger full body. Hope this is just a photographic illusion. Or maybe Alan Joyce was indeed the test body size! Ps still expecting Mr Joyce to keep his promise of free wifi and that means zero charges, no sneaky extras. Agree with comments on the appearance of less in the height department. But will they have the signature hardness that Qantas slimline seats have revolutionised. The hype certainly seems familiar. I save more as a semi-retired person, and fly business class. to many bad experiences in both eco and ‘premium’ eco. ps. when we fly overseas, it’s always with the flag carrier of the country that we are visiting. So many negative comments despite the fact it will not be available to try until December. No doubt if Singapore Airlines or Virgin had introduced this everyone would have been falling over themselves with praise. Having said that, QANTAS appears to be falling into line with every other airline and describing everything with even the slightest change as “revolutionary”. To me, all airlines should have just premium economy , business and first unless you are budget airline.